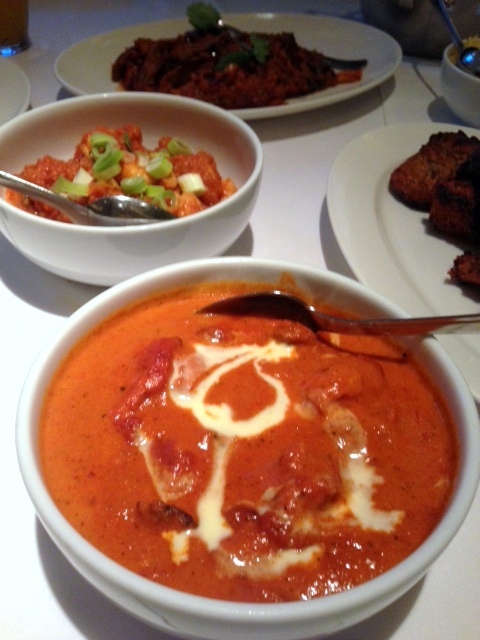 Chicken tikka makhani (£17), chargrilled chicken thighs in a creamy butter sauce was dreamily good with lots of lovely richness in the decadent sauce. A ‘venison roast’ (£24) with strips of venison fillet cooked with onions, tomato, ginger, coconut and various spices proved to be excellent also. As well as being tender, there was a wealth and depth of flavour coming through from the use of the various spices and other ingredients. 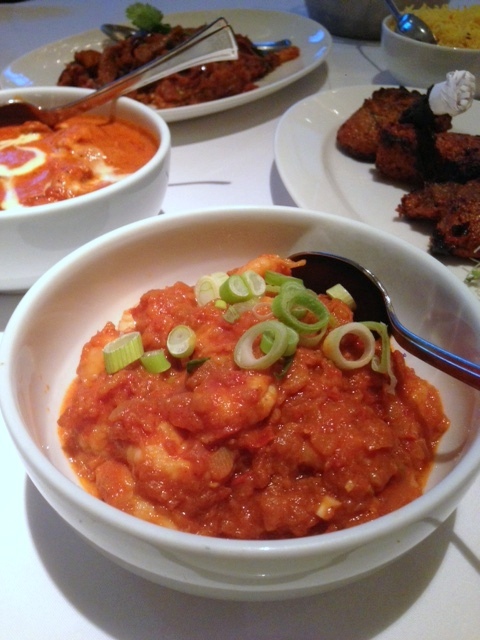 Prawn hara pyaz ka (£24), black tiger prawns cooked with spring onions, scallions, and tomatoes was pleasant. Also enjoyable were the Adraki lamb (£26) chops with ginger from the clay oven. These were tender and satisfying if a touch salty. 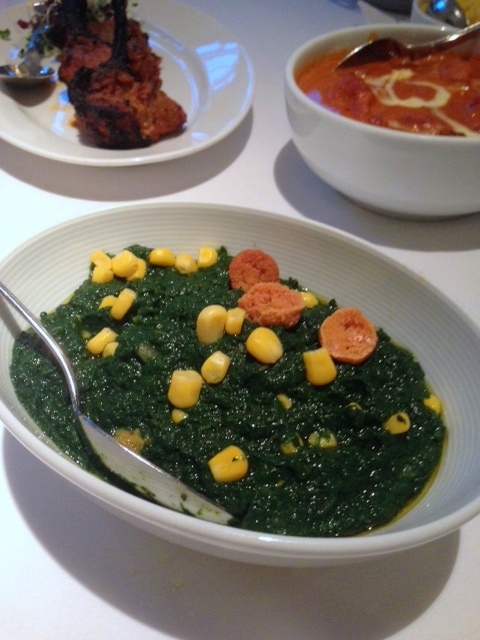 We also had the Wadi bhutta palak (£10) for a side, a delectable and creamy spinach concoction consisting of lentil buttons, corn kernels, and golden garlic. This was one of the highlights of the evening – delectably creamy, wonderfully flavoursome and incredibly well made. For dessert we tried the trio of chocolate (£11) which consisted of raspberry chocolate, a chocolate samosa and a chocolate brownie. The raspberry chocolate, akin to a ganache, was delicious. However we found the samosa a little oily and the brownie rather dry. A carrot cake (£8), gulab jamun kulf, was our preferred dessert. Delightfully spongy and soft, it had been drizzled with syrup. It was delicious and fragrant, if a touch too sweet. 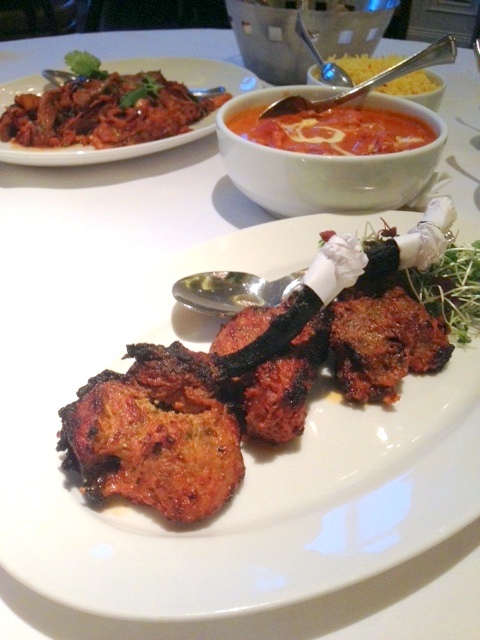 We thoroughly enjoyed the opulent experience that was Bombay Brasserie, with its delicious food and opulent setting. The décor was a dream and provided the perfect backdrop for a refined dining experience. The service was well-mannered but churned over quite slowly unfortunately. We found the wait times for our food a little slow. And the biggest drawback – the rather high prices. Refinement comes at a cost. 1) All the food was delicious, but the highlight was the wadi bhutta palak. 2) The decor is glorious. 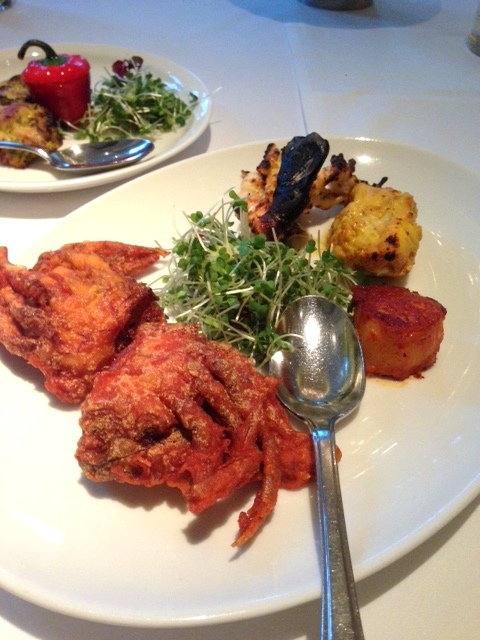 3) Bombay Brasserie provides a very refined experience. 1) The service was a little slow. 2) The menu is a little pricey. Average Price: £37 to £54 a head for three courses and a side to share. Excludes drinks and service. Whoa this food looks delicious! Hi Christina, Yes it was really good!